Have you always wanted to run or walk a 5K but didn't know how to begin training? Maybe you are nervous or don't want to do it alone? Maybe you have had a hard time sticking to a training program in the past? If you answered "Yes" to any (or all!) of the above, our iconic beginner program is perfect for you! In just 10 weeks, you'll go from the couch to crossing the finish line at one of our favorite 5k's in early June (choose from Celebrate West Hartford 5K, Iron Horse 5k or The Big Run. We will introduce you to the lifetime fitness activities of running/walking and encourage you to live a healthier lifestyle in a fun and supportive environment. We have super passionate coaches – most of whom are graduates of this program themselves – who will be with you each step of the way. Plus, you will be training with folks just like yourself! Walk, Walk/Run Intervals & All-Run Programs available; you are welcome to switch between levels depending on how you feel each day. For those doing the run/walk program, we use the "Galloway Method" which alternate run/walk intervals and slowly ramps-up the time spent running and distance covered (e.g. for the first practice we will go 1.5 miles with a 2min run/2min walk interval - but by the end of 10 weeks, you will be able to run/walk 3.5 miles with a 4min run/1min walk interval). Coaches will call out the run/walk intervals, but it is recommended that everyone have a watch or phone app with an interval timer so you can track the intervals yourself. For those who have recently completed a No Boundaries program or have some recent running experience, you will be encouraged to try to reduce your run/walk intervals or even challenge yourself to run the entire distance at practice. No worries if you need to walk some - our goal is to help you go a little further and feel a little stronger each week. For individuals just returning to exercise or starting something new, the WalkFit program may be just for you! It follows the same distance increments for the run/walk group, but at a walker's pace. Once you get out there moving, who knows what strides you'll make in the future! All program participants will receive a proven training program (we've used it to help over 1,500 new runners complete a 5K), cool team t-shirt, three coached runs/week, in-store discounts and weekly emails to keep you motivated and informed as well as a great new group of friends you will soon call Running Mates! Your program fee does NOT include the race registration fee - but you will get a discount code to save money on our goal race. Signing up is the hardest part because it's all you. Once you do that and show up to the first practice, we will be with you the rest of the way...and we'll even make it FUN! Program Start: Intro/Welcome Session for 1st time participants: Saturday, March 23rd at 9 am. First Official Practice: Saturday, March 30th at 9 am. Program Fee: $95.00. Price does not include race registration fees. Price increases $10 on March 30th. Description: Come see how Running Changes Everything! 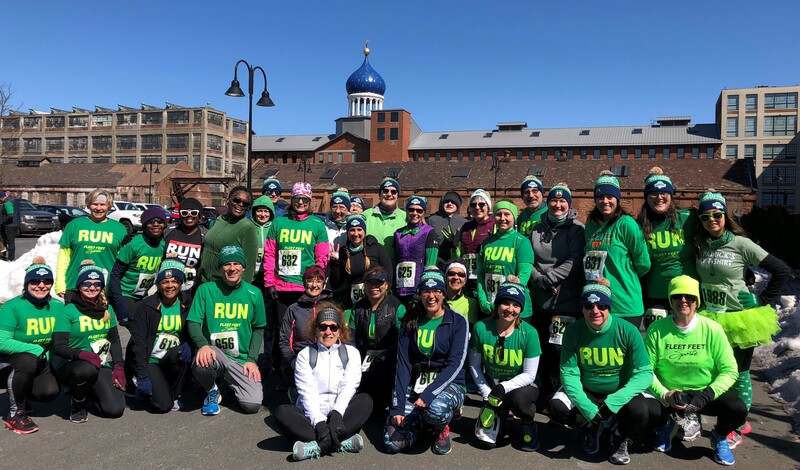 This 5k training program is geared towards beginners and offer three options: all-walk, walk/run intervals and all-run (you can switch groups depending on how you feel each Saturday. Energetic coaches will join you during the run and cheer you on every step of the way!